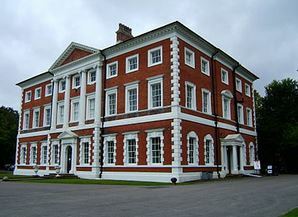 1) (Clifton and Lytham Hall, co. Lancaster; descended from William de Clifton, one of the collectors of the aids for the county of Lancaster temp. Henry III., and now represented by John Talbot Clifton, Esq., of Clifton, and Lytham: Sir Thomas Clifton, of Westby and Clifton, was created a bart. 1642, and d.s.p.m., 1694). Crest—A dexter arm embowed in armour holding a a sword, all ppr. Motto—Mortem aut triumphum. 2) (Clifton Hall, co. Nottingham, bart. Title dormant since 1869). Sa. a lion ramp. within an orle of cinquefoils ar. Crest—Out of a ducal coronet gu., a demi peacock, per pale ar. and sa., the wings expanded, counterchanged. Motto—Tenez le droit. 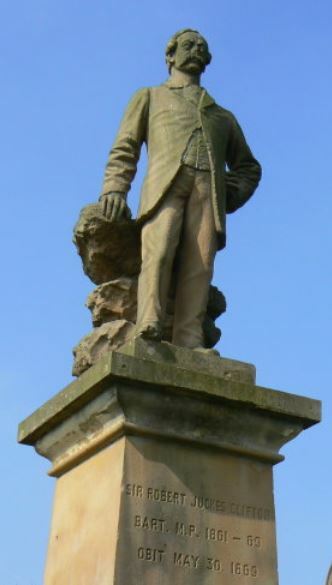 3) (Clifton Hall, co. Notts; exemplified to Robert Henry Markham, Esq., on assuming, by royal licence dated 6 Aug, 1849 the name of Clifton instead of Markham). Quarterly, 1st and 4th, sa. a lion ramp, within an orle of cinquefoils ar., for Clifton; 2nd and 3rd, az. on a chief erminois a demi lion issuant betw. two crosses pattee gu., for Markham. Crests—Clifton: Out of a ducal coronet gu. a demi peacock per pale ar. and sa. ; Markham: A lion sejant guard. winged or, with a glory round the head ar. semee of crosses pattee gu., and supporting an ox yoke gold. Motto—Tenez le droit. 4) (Lord Clifton; John de Clifton was summoned to Parliament 1376-88; title in abeyance). Chequy or and gu. over all a bend erm. 5) (Bokenham, co. Norfolk). Same Arms, on the bend a fleur-de-lis sa. for diff. 6) (Toftrey, co. Norfolk). Same Arms, on the bend a mullet sa. for diff. 7) (Cheshire). Az. on a bend ar. three mullets pierced gu. 8) (Hodstock). Ar. a lion saliant, tail forked sa. 9) (Kent). Sa. on a bend ar. three mullets gu. 10) The same Arms. Crest—An arm lying fesseways vested ar. holding in the hand ppr. a hawk ar. 11) (cos. Lancaster and York). Ar. on a bend sa. three mullets of the first. Crest—An arm embowed in armour ppr. garnished or, holding in the gauntlet a sword ar. hilt gold. 12) (London, cos. Herts and Middlesex). Sa. on a bend ar. three mullets gu. in the sinister chief a fleur-de-lis or. 13) (Barrington, co. Somerset). Sa. a lion ramp. betw. eight cinquefoils and a trefoil in chief slipped ar. 14) (co. York). Ar. a lion ramp. sa. armed gu. within an orle of eight cinquefoils of the second. 15) (Sheriff of Norfolk, temp. Henry VI.). Sa. semee of cinquefoils and a lion ramp. or, within a bordure sa. verdoy of trefoils ar. 16) Sa. a lion ramp. ar. langued and armed gu. within a bordure of the second, charged with eight trefoils, slipped of the field. 17) (arms in a window in Dorchester Church, co. Oxford. Visit. Oxon). Sa. a lion ramp. ar. debruised by a bend gu. 18) Ar. a lion ramp. az. armed gu. 19) Gu. a lion ramp. ar. crowned or. 20) Ar. a chev. sa. betw. three roses gu. 21) Ar. a chev. sa. betw. three cinquefoils gu. 22) The same, within a bordure gobonated or and az. 23) Gu. five bendlets ar. 24) Gu. billettee a lion ramp. ar. 25) Ar. a lion ramp. az. debruiscd with a bendlet or. 26) (quartered by Bromley, in Harl. MS., 1507). Ar. on a fesse sa. betw. six fleurs-de-lis gu., three cross crosslets or. This surname is of local origin meaning “of Clifton”, parishes and diocese in Carlisle, Ely, Gloucester, Bristol, Manchester, Oxford, Ripon, Southwell, York, and several other areas. Another author claims it’s a small village in England, meaning “the town on the cliff”. The earliest recorded location bearing this name was Cliftune, recorded in 944 AD in Bedforshire. Several locations are also recorded in the Domesday Book of 1086 AD: Cliftone (Chesire), Clistune (Debyshire), and Cliptune (North Yorkshire). The etymology of the word is from the Old English words clif (slope) and run (settlement or enclosure). Early people bearing this surname include Gilbert de Clifton (Yorkshire), Peter de Clifton (Yorkshire), Robert de Clifton (Oxfordshire), Richard de Clifton (Oxfordshire), and Johannes de Clyfton (Yorkshire), and a Willelmus de Clifton, recorded in the Poll Tax of Yorkshire in 1379 AD. Early marriages involving this surname include M argery Clyffton to Thomas Molle at Cropredy, in 1546, John Clefton to Elinor Mechell in 1591 at Great Milton, Richard Clifton to Mary Hedges in 1556 at Waterberry. The Cliftons of Clifton, county Lancaster, have possessed that estate for more than seven centuries. This family is discussed at some length in Bernard Burke’s The Landed Gentry. The lineage of the ancient surname traces back to the village of Clifton, near Nottingham, so called from its location on an elevated plateau above a cliff of red sandstone on the banks of the river Trent. 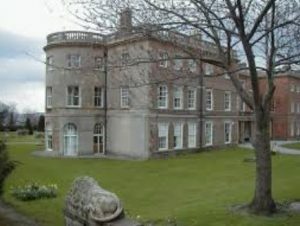 The manors of Clifton and Wilford were purchased from the family of de Rhodes during the reign of King Henry III by Sir Gervase de Clifton, to whom the purchase was confirmed by King Edward I in 1281 AD. Sir Gervase was the Sheriff of counties Nottingham and Derby in 1279 AD and was also Sheriff of Yorkshire. He married Amflicia Sampson of Epperston, and died in 1324, leaving a son: Gervase de Clifton, sometimes written de Glapton, who married Alicia Rabacy and had a son named Sir Robert de Clifton. Robert married Emma Moton and died in 1327 AD. His great grandson was Sir John de Clifton, who married Catherine Cressy of Hodsock, daughter of Sir Hugh Cressy, and acquired much land through the marriage. He was a representative in Parliament and was killed at the Battle of Shrewsbury 1403. He had children, including Sir Gervase Clifton (died 1453) who married Isabella Francis and had a successor named Robert Clfiton who married Alice Booth of Barton. He founded a college dedicated to the Holy Trinity and died in 1478. He had a son named Sir Gervase Clifton, who was Sheriff in Nottingham and Derby in 1471 and 1477. He was an Esquire of the Body to King Edward IV and was made a Knight of the Bath at the coronation of Richard III. The lengthy pedigree description in the book continued for another page of small text, and ends with Henry Robert Clifton (born 1832) who married Elizabeth MacBean who succeeded the estates of his cousin, Sir Robert Juckes Clifton. Early Americans bearing this surname include Thomas Clifton, who came to Virginia via London in July of 1635 aboard the Primrose. Others include Jane Clifton (Virginia 1633), Richard Clifton (Virginia 1642), Sara Clifton (Maryland 1650), and John Clifton (Maine 1709). Sir William Clifton (1663-1686), from France, was third Baronet Clifton of Clifton, Nottinghamshire, and Deputy Lieutenant of Nottinghamshire from 1683-1686. In 1685, he started a regiment which later became the 15th Regiment of Foot and later the East Yorkshire Regiment.